The trailer for rollerblades adventures. Baptised Misty, c'est le second modèle de charrette de voyage à roller longue distance elle a fait ses preuves sur plus de 1500km l'ors du Spanish Trip. C'est certainement un nouveau modèle qui sera utilisé dans the next adventure. 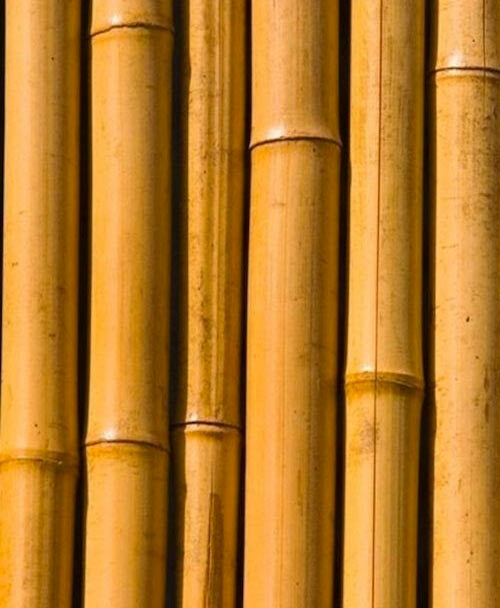 Bamboo : This extraordinary material promises both a supple, lightweight and solid structure. 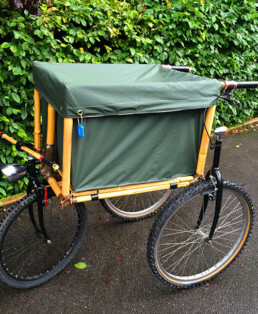 Brakes : The cart is equipped with one break by wheel for more comfort and maneuverability. Sail : The sail is 2 meters long, it was added on the road during the last adventure. 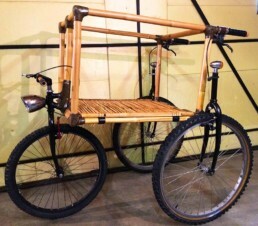 "On the belly" The handlebars and the front brake make it possible to drive the cart for short runs without having to put on the rollerblades. Waterproof : A waxed canvas fits on the structure and makes it completely waterproof. 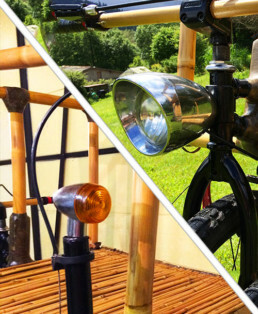 Lights : For safety, two LED lights are in the back and a bigger one in the front. 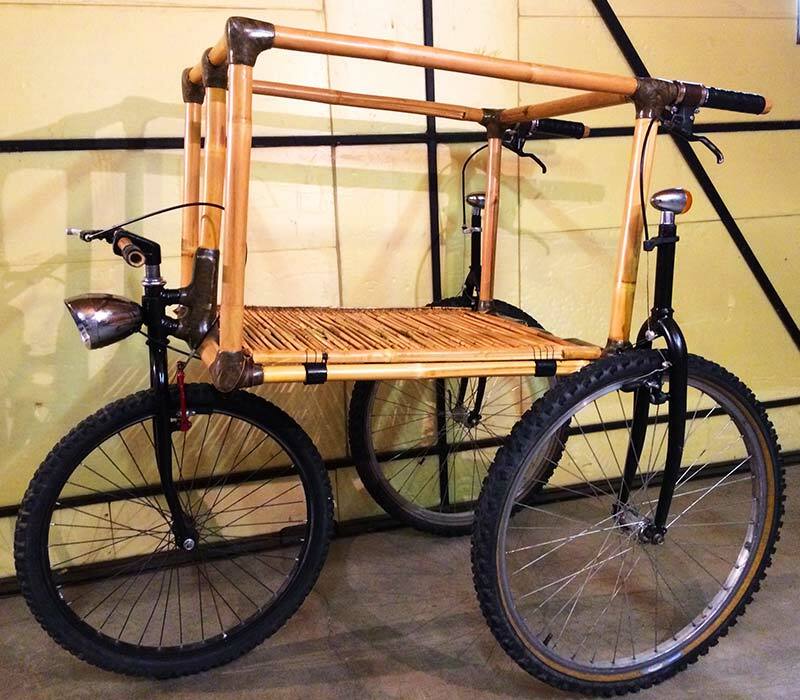 Everything is bamboo except wheels and forks. 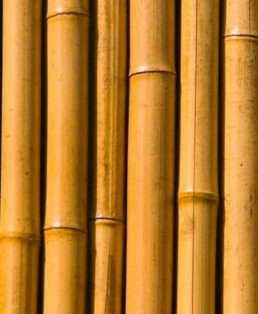 The bamboo tubes are linked together by strong junctions made of flax fiber and epoxy resin. A brilliant effect is obtained after sanding and a good cap of varnish. A very special thank you to the excellent welder and friend, Thierry Dumont. His help is still very precious to me today. A big thank you also to the Talented Inbo' for sharing their know-how and supporting the project. A great advantage for downhill passes or even generally to retain all the weight of the equipment.This gadget is of major importance in the comfort and safety of the trip. 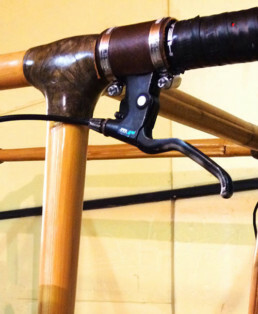 In practice it is necessary to skillfully dose the pressure on each handle so as not to deviate too much the trajectory of the cart in the straight lines. In curves, the dual-control brake turns out to be a real asset to balance the trailer. It was not planned in the original plans. It is on the road, confronted with the squalls of the coast that it was imagined. 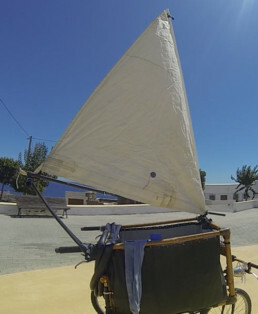 It was hacked with an old sail offered by the nautical club Benidorm, recovered métal tubes and old bicycle inner tubes. It has proved very useful in certain situations. However, there are a number of parameters that must be respected in order for it to operate at its full potential and without risk. How important it is to learn from one's mistakes ... In the Chiriqui Mountains of Panama, during the first adventureI had a bad fall ... What a lack of preparation!The front of the cart is now equipped with a brake and handlebars. In very hilly areas, the climbs are too steep to skate, you have to push while walking. So I have to remove my skates. 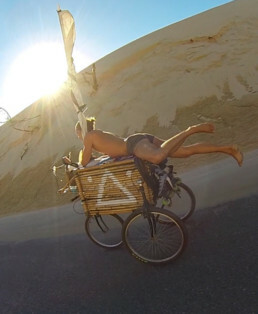 For the descent, all I have to do is lie down on the cart and enjoy the scenery. When traveling and camping outdoors, it is important to keep all equipment dry.The trunk is as waterproof as strong. Sometimes, for climatic reasons or because of poor timing management, it is necessary to travel at night. As lights, three LED bulbs on a single circuit. They are connected to each other, then to a small rechargeable battery. The latter is located under the cart, in a large tube of aspirin that keeps it dry.